Chip: Any thoughts about running & passing plays per game? Will we see the number of pass plays per game remain same w/ Mitchell & Scott-Wesley returning? Or do you think that no matter who we have to throw to, that the running game will become more heavily relied upon. Thanks for all you do! & Go Dawgs!! You're right, Andrew. The comparisons of Georgia's defense under Pruitt this year and under Grantham at Louisville are pointless. Grantham was great (OK, decent) at Georgia when he had Alec Ogletree and Sanders Commings and Jarvis Jones. Not so great last year when he had a bunch of newbies. As always, it's about personnel. I think it's going to take a year or so before Pruitt has the type of players he had at FSU last year. But he's working hard to get them! Chip, as a Florida State fan living in Atlanta, I've enjoyed discussing Jeremy Pruitt's defense and the changes being made at UGA. I think he is a great coach (of course, we won the NC right? ), but I told them all that he had a much more difficult task at UGA based on the state of the UGA defense after Grantham left. When Pruitt got to FSU, he inherited an extremely talented and top rated defense. How long do you expect it will be until UGA sees the type of defense FSU had last season? I don't know if that's still possible for Keith but I'll ask. His injury happened within the first three games, which is part of the rule, but I don't know if he played too much before that. I'll check. ... But as I wrote over the summer, I thought a redshirt was a good idea for Marshall this season period. He had some serious work done on those knees and his surgeries (both knees) didn't come until December of last year. But the kid wanted to play. Hey Chip, Jeff Dantzler was saying last week that Keith Marshall was eligible for a medical redshirt this year if needed. Do you know if that is being seriously considered? Good morning, John E. There really hasn't been much of an update provided on Marshall, but I can tell you what I've seen. He's walking around on the practice field with a pretty big limp and doesn't look like he's going to be back anytime soon. There was no structural damage, but he got bent backward against Troy and hyperextended both his knee and ankle. I suspect it'll be a couple of more weeks at least. Hello, Trae. I'm fine, thank you, and I hope you're week is going well, too. ... Yes, I think there's a growing sentiment to get Brice Ramsey and/or Faton Bauta more looks going forward. As long as Hutson Mason is struggling in the passing game, that's an option. But you have to be careful here. While Mason struggled some last week and certainly isn't Brett Favre when it comes to throwing the football, he's completing 69 percent of his passes, has only two turnovers all season and the Bulldogs are averaging 462 yards and 45 points a game. So it's not like you've got an offensive abomination going on here. Hey Chip. Hope your week is going well. Do you sense any kind of growing or present sentiment, within the organization as well as outside, that supports iving Ramsey additional playing time to see if he can boost the passing game? Also, do you think that MM and JSW will improve Hutson Mason's passing numbers enough to quiet any sentiment that may exist? If it does. Thanks. Greetings everyone. Happy Thursday to you. It's homecoming week for the Bulldogs. Vanderbilt coming to Sanford Stadium on Saturday (4 p.m., SEC Network). The Commodores (1-4, 0-3 SEC) are struggling this season in their transition to new coach Derek Mason. Hasn't gone so well last time they were in Athens. They've lost the last two by the combined score of 91-3. All righty then! See you guys next Thursday on the UGA Mailbag -- brought to you by Kroger. We'll be able to talk about the Bulldogs' impending game against Tennessee! So long, everybody. No, JMonty. Obviously the SEC champion is going to get there. And what if UGA goes 11-1, wins big the rest of its games and SCarolina ends up in SEC championship? Again, anything still can happen. With the loss the SC and 2 very low strength of schedule games left. Does that all but eliminate UGA from the playoffs talk? Malcolm Mitchell still has not made an appearance in practice. Not expecting him to play unless and until he practices for at least one solid week and maybe two. But I never expected him to come back this week. If he doesn't play against Tennessee or Vandy, uou might start considering a redshirt for him. Sounds like JSW may be back soon - not as optimistic about Mitchell. Getting any sense for Mitchell's return? Gaillard it probably headed toward a redshirt. That's me saying that. UGA doesn't project such things. There is a lot of hope Lamont Galliard steps up, no? Joe, the Bulldogs have much improvement to make to slow down anybody's passing game. But I do believe SC's offensive line is one of the best UGA or anybody will face. The Vols are rebuilding up front and Georgia's playing at home. I'd expected considerably more success pressuring the passer. Do you think UGA will be able to slow down the Vol's passing game next week? 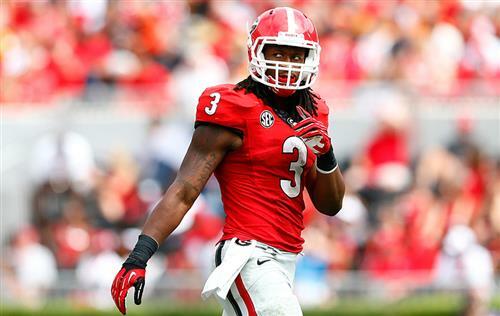 No, POAD, I don't think Gurley has an on-field attitude problem. No, he shouldn't have head-butted the SC player. But go back and look at the SC players actions. He comes sprinting across the field to get in Gurley's face and taunt him. What should he expect? A high-five? Do you think Gurley has an onfield attitude issue. He has done the headbutt and taking swings at players more than a few times in games when he gets stuffed? aldawg, yes, my guess is Pruitt noticed everything that happened in that game. do you think Pruitt noticed the problem with the blitzes being early and giving the ol time to pick them up? I don't know that that's the case, James. SEC won 7 of last 8 national championships and played in all eight. Not sure the league has a non-conference problem. I saw earlier today that Auburn has not won an OOC road game in 17 years. Why is it that so many SEC teams fail to find good games on the road? Dawg350, as Jeremy Pruitt said, if you become a great pass rusher, teams come in with a plan for you. Steve Spurrier, a pretty good schemer, had a plan for him. Same for teams that planned-up for Jadeveon Clowney and Jarvis Jones. Pretty good coaches in this league. What happened to floyd? ?he really had such a great game against Clemson. I expected I would see a similar game vs SC but that wasn't the case. I don't know James. I don't have an accounting in front of me. Jonathan Taylor this year, Sanders Commings a few years back and Montez Robinson in 2010 off top of my head. To follow-up on the domestic abuse question. How many GA players have had similar issues? I can't remember many? Great question JAMES but we should all let the Legal process work itself out before taking a players job/future away until found guilty of something. I considered Leonard Floyd and Jordan Jenkins outside linebackers. Talking about defensive tackles and noseguards. No defensive line stars? Leonard Floyd? South Carolina neutralized the pass rush with extra lineman. Hutson's a great kid and has a great attitude. He takes copious notes about what he needs to improve on every Sunday during film study. He's quite conscientious. He'll handle it differently next time I'm sure. Any sense for how Mason took the grounding call? He needs to be strong and confident for UGA to win. I have some concern over the lasting effect of that - interested in your assessment. Georgia has been known as one of the best "vertical passing" teams in the country the last few years. So, yes, I'd say Mike Bobo has some pretty strong reasons why he's not trying to go deep much. bobo didn't attempt one deep pass the whole game. do you think its lack of confidence in mason or no deep threat receiver? The only entity that takes longer to change policy than the NFL is the NCAA. Can't even get schools in the same league to agree on drug and alcohol discipline. Nah. Georgia runs a lot of the same stuff. Sometimes it's the same play but with different personnel or out of different formations and with different reads, etc. Like bootleg call that didn't work on the Bulldogs' last possession. They ran almost the exact same play and scored on a TD pass to Jay Rome just two possessions earlier. 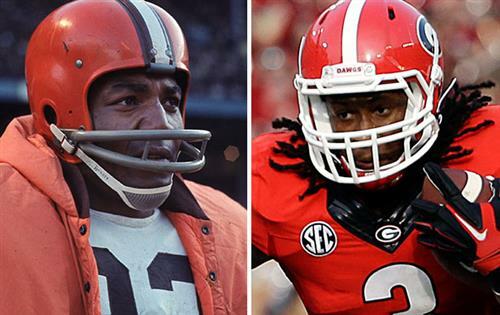 You agree with Frank Tarkenton who suggests Todd Gurley is the next Jim Brown? Well, it looks like my time is up. Can't wait to finally cover a ballgame. Whether you're at the game Saturday or not, be sure to visit our website as we'll be providing live stories, blogs and updates all afternoon. And we'll have lots more coverage coming this week in advance of the game. Thanks again for participating in the AJC Live360: UGA Mailbag brought to you by Kroger. See you next Thursday at 11:30 a.m. I'd say accountability, more than anything. Chip , What has our new defensive cordinator brought to the dogs that you see thats differnt from last year? He prefers man, but will do what he has to do.